I always take a brownie that is located along an edge just because I think they taste better with a crust. Apparently I’m not alone and some guy have invented a pan that will give you as much edges as possible on your brownies. This is a great idea. The edges of brownies are always the best. 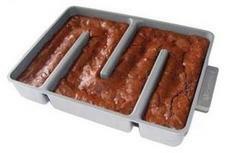 This pan allows you to have a pan full of brownie edges. The sidewalls are made from cast aluminum to distribute heat evenly to every serving, supposedly resulting in fewer undercooked middles and burned edges. You can also use it for chewy cookie bars, zucchini bread, cornbread, cereal bars, baked macaroni and cheese, casseroles, bread puddings, and layered dishes like lasagne.